Kristin Thorne has the latest from Far Rockaway. FAR ROCKAWAY, Queens (WABC) -- A man is facing charges after what police say was a hit-and-run accident in Queens Sunday that left a young woman in critical condition. Denzel Watson, 23, is charged with leaving the scene of an accident with a serious injury and aggravated unlicensed operation of a motor vehicle. Authorities say Watson has seven prior arrests, all sealed except for a March 2013 arrest for criminal possession of a stolen and loaded 22-caliber gun. The victim, 21-year-old Urabia Nelson, was hit by a white Mustang as she was crossing Beach 19th Street in Far Rockaway Sunday afternoon. "She doesn't look good," the victim's mother, Barbara Nelson, said. "She's not doing good. She's barely even blinking an eye." Barbara Nelson says it's hard to look at her young, vibrant daughter in the hospital, now suffering from a severe head injury and broken leg. Urabia Nelson was going to grab some lunch with her friend, sister and her sister's 5-year-old daughter before going to her shift as a cashier at nearby Compare Foods. "All I hear is screech, boom," friend Nydrah Gaynor said. "And I turn around, and I see my friend 10 feet in the air. And I'm just like, oh my God." Police say Watson fled the scene. "I just see my sister laying on the floor," sister Shatavia Way said. "At first, I'm thinking she's just covering herself, until I realize she's not moving. I get across the street and my sister is bleeding through her mouth, her nose." A man and a woman who were close behind the Mustang followed Watson for several blocks, giving police directions to where he was. For that, Nelson's mother says she's extremely grateful. "He deserves the ultimate punishment, the max, whatever they can give him," Barbara Nelson said. Witnesses said the Mustang was speeding down Seagirt Boulevard at double the speed limit, trying to beat the red light. Watson was arrested around 2:30 p.m., about 25 blocks from the scene near the Nassau County border. 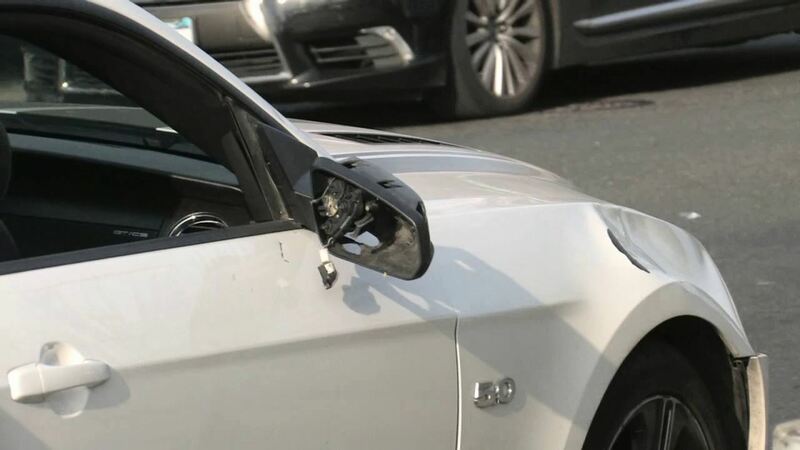 The Mustang had heavy damage to the front passenger side, a busted rear-view mirror and a massive dent about the front right tire.